Combine dry ingredients in a bowl. In a separate bowl whip egg whites together until fluffy, set aside egg yolks. Fold whipped egg whites into dry ingredients. Add egg yolks, milk and oil to dry ingredients and mix. Heat pan on medium heat. 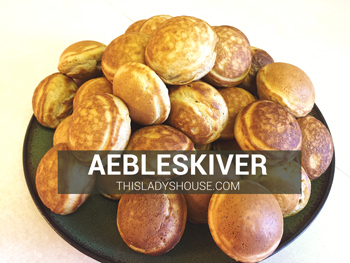 Fill each cup on aebleskiver pan half full and cook. Turn pan slightly when it has cooked on the edges. Continue turning slightly as it cooks so that the aebleskivers will cook into a sphere. Serve with yummy toppings and syrup! This entry was posted in Recipe and tagged Breads, Breakfast, Side dish.